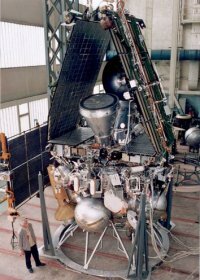 Mars 96 was an ambitious Russian Mars probe, launched on November 16, 1996, which fell back to Earth after a failed burn that should have taken it out of Earth orbit. The probe included an orbiter, two small autonomous landers, and two surface penetrators. Having achieved an initial 160 kilometer-high circular orbit, Mars 96 was to have been boosted onto a Mars trajectory by the upper stage engine still attached to the probe. Instead, a misfiring of the upper stage placed the probe on an orbit that caused it to reenter. No advance warning of the probe's imminent descent was given by the Russians despite the fact that Mars 96 was carrying 270 grams of plutonium-238 as an energy source. Its final whereabouts remain unknown although parts of it are presumed to have fallen into the South Pacific and possibly regions of Bolivia and Chile.